The greatest wreck diving location in the world! Truk Lagoon is quite simply the greatest wreck diving location in the world. Scores of virtually intact large WWII wrecks filled with cargoes of tanks, trucks, artillery, beach mines, shells and aircraft rest in the crystal clear waters of the Lagoon – each a man-made reef teeming with life. Truk was the main forward anchorage for the Japanese Imperial Navy and merchant fleet during the early days of WWII. Protected by a 140-mile coral barrier reef, with only a few heavily defended entrances, it seemed a well-protected safe anchorage. The lagoon had been fortified by the Japanese in great secrecy during the 1930s – the Allies knew little about it. By 1944, the tide of war had turned against the Japanese – the Allies were pushing westwards across the Pacific islands towards the Japanese homeland. A daring U.S. long range aerial survey showed the lagoon with the full might of the Imperial Japanese Navy; battleships, cruisers, aircraft carriers, submarines and destroyers, along with scores of large supply ships and transports. The Allies decided to attack immediately. Sensing this, the Imperial Japanese Navy scattered but the merchant ships remained to offload their cargoes of aircraft, tanks, artillery, mines and munitions. Other heavily laden supply ships continued to arrive, unaware of the Allied assault plans. Fresh from the Kwajalein Atoll assault, Task Force 58 was formed for an immediate attack – Operation Hailstone. In total secrecy, nine U.S. carriers holding more than 500 combat aircraft steamed towards Truk – supported by a screen of battleships, cruisers, destroyers and submarines. Before dawn on 17 February, Strike Groups of 12 Hellcat fighters swept in low towards Truk under Japanese radar and immediately began strafing Japanese airfields. Soon, hundreds of aircraft were involved in one of the largest aerial dogfights of WWII which was over within an hour. With air superiority established, U.S dive-bombers and torpedo-bombers spent the remainder of the day and the following day sinking all the large ships trapped in the lagoon. With Truk neutralised as a naval and air base, the Pacific war soon ended. The sunken ships of Truk Lagoon with their war cargoes were largely forgotten about until 1969, when an expedition by Jacques Cousteau located and filmed many of the wrecks. 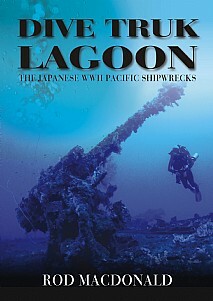 The resulting TV documentary, Lagoon of Lost Ships, went viral. Truk’s secret was out – and the beautiful wrecks, untouched since WWII, have proved an irresistible lure for thousands of divers each year since then. This will be of enormous appeal to divers, anyone interested in maritime and WWII history, as well as those with an interest in shipwrecks.